The Suqqu S was released a few years ago by Chikuhodo, unfortunately and despite the continuous worldwide interest, it isn’t made anymore. It’s a pencil-smudge-placement brush, allows you to work on smaller eyes with the softest hair. Today there is a high demand for it but… why do we want it so bad ? Because it’s truly unique, this is (was) a luxurious dense little pencil brush that could approach the most sensitive skin in a controlled yet effortless way. 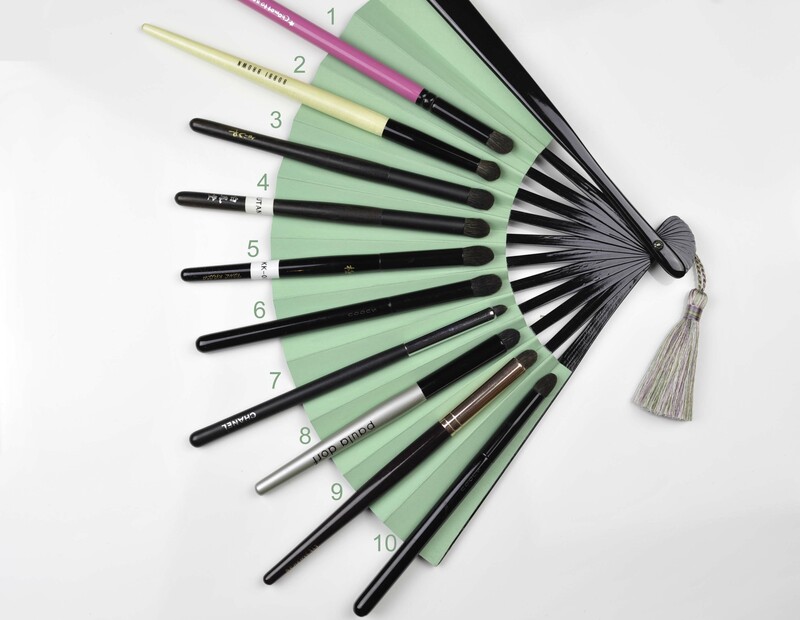 It’s probably one the most coveted brushes today. For more than a year I had it in my possession thinking it was the Suqqu M that I owned, to be honest with you when I was reading on other blogs that this brush was great for lower lashline application I thought that the result achieved with this S was too thick to be the S, that’s why I thought the one that I had was most probably the M. I simply couldn’t find any reference of the size difference between both of them. One day I took it with me at the Suqqu counter and they confirmed it was the S, you don’t even imagine how happy and relieved I was because knowing what I am capable of when I want something, it could be pretty dangerous for my mental health – not that I can pretend being that sane today anyway. But, if this was the S, I still wanted more precision and to create a thinner line in the lower lashline so in a way… I was a bit disappointed. The most regular questions and requests I get are to find dupes for very rare or expensive brushes. This Suqqu S is probably the most highly requested. I took over the mission and happily started my hunt for the perfect dupe. There were so many disappointments along the hunt road, and I still have to understand why Chikuhodo don’t make it anymore. I asked them when I was over but they said they did not plan it. Next trip I will have to insist a bit more. The hopes for finding the perfect dupe were recently lost but I calmed down when just a few days ago I found the brushes that made the hunt not a such wasted mission. Despite not being perfect dupes for this Suqqu S, my recent discoveries reflected even additional benefits that the Suqqu S didn’t have. Note : the shorter and firmer head makes strongest applications. So why wouldn’t we use only short and firm brushes ? 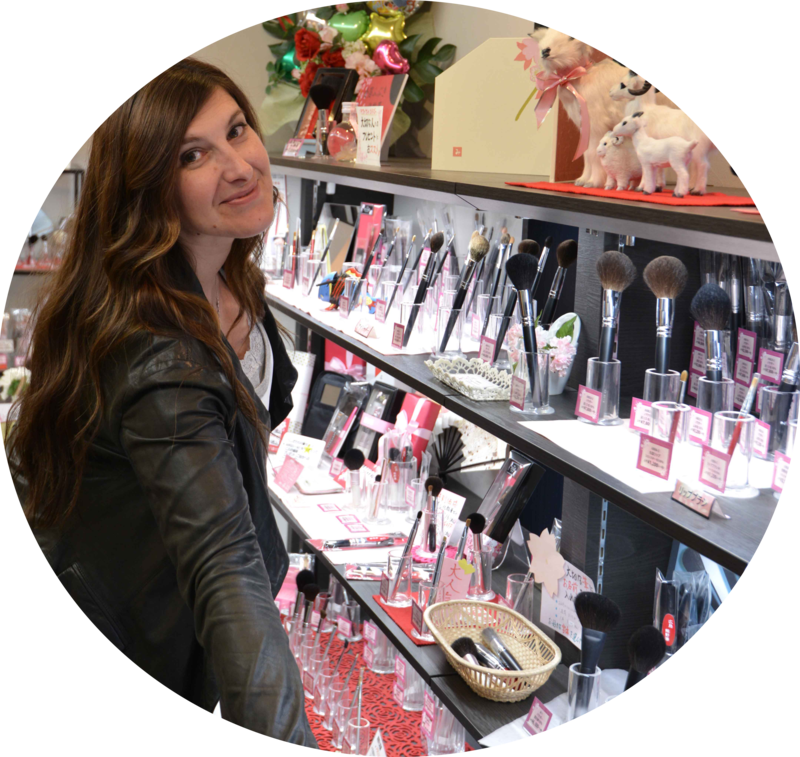 One of the best reasons is because there are times where we want to build up rather than blend as too much blending may irritate the skin. Eye definition can be either applied soft or strong, thin or thick depending on the look we go for and we don’t always want a dramatic lashline application. Some pencils, with the help of some technique, can just manage anything, even though I am a crazy brush lover, I don’t believe we need a hundred pencils to do a variety of looks but the best pencil you have the more you will save time. Here is the overview of the similar -or not so similar- options to the Suqqu S.
I own two of each Mac 219 and Koyudo C011, I put them here both because the more a brush is small, the more a small difference in the making can change its functionality. The same brush can have either a more pointy tip or a softer feeling to it. The artists who make them are not always the same ones and the hair can very slightly differ from batch to batch (although there are controls and techniques to keep the quality as consistent as possible). I put all the brushes I have in duplicated just for reference, it could eventually show an example of how they may differ if any difference at all. The Sigma and the Zoeva are the less soft of the bunch. Then comes the Mac ones, then Hakuhodo, then Tom Ford, and the softest options are the two Koyudo C011. 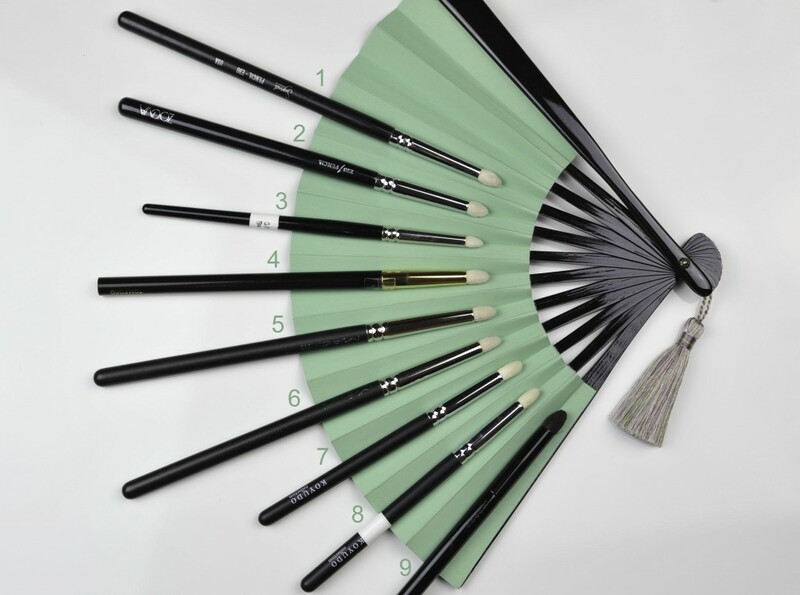 All these are goat hair (not same material as the Suqqu S) but I feature them because maybe you are just looking for a pencil brush regardless of the brand and in that case one of these could just do the trick perfectly well. The Sigma and Zoeva here are just too rough for me, my skin (and specially the skin around my eyes) is extremely sensitive, truly scarily sensitive. The Mac 219 were ok for many years but due to a health problem that was causing very dramatic migraines, I had to stop using them. That’s when I started looking for softer brushes. The Koyudo C011 is similar price range as the Sigma (approx 12-13 usd), it’s firm (more precise) yet soft so it can be a great option to the Suqqu S. If you want even more precision (and still a white brush) you should go with the Hakuhodo G5514. If you want a more versatile and luxurious option I would rather pick the Tom Ford 14, but it has a high price tag so if you are not really attached to the brand I would switch to less expensive options shown further down (Wayne Goss or Chikuhodo). My hunt took me to this Chomotto but when I received it, of course that was too big to compete against the Suqqu S. And in comparison, too rough. The Bobbi Brown was one of my first high end brushes but today it is also too rough, even though it’s not rough for most of you, it is not something I can enjoy using on my eyes today. The Yojiya, Hakuhodo Kokutan T, Kyureido Fine-Kalla KK-004 and Suqqu M are here to show you the difference with the Suqqu S, although quite similar softness, they are way bigger. The Kyureido doesn’t look available anymore, I found that one in Rakuten. The Chanel 24, another discontinued brush is crazy efficient and this could be the next mission-hunt dupe (the N.07 brand has a very similar and great pencil that I own -somewhere, I think I may have lost it- but it’s not soft enough for sensitive skin). This Chanel is more precise than the Suqqu S, always manages to get the right application and if you find this brush, just buy it, if you buy it and you don’t enjoy it, please tell me because I will buy it from you. In the past Paula Dorf made a smoky lid brush that I heard was smaller and more precise, this new one is bigger, it is more similar in size to the Suqqu M than the S. Same for the Charlotte Tilbury Smudger, it’s in between the Suqqu S and M. It is really nice actually, for me it’s just a bit too thick for lower lashline application (unless I have very little product on the tip) but if you like slightly thicker applications you will enjoy it, I really have to say that I am more and more impressed with this little brush, I think it’s growing on me and my love for it increases with time 🙂 Not soft like the Suqqu S even though it’s squirrel hair but it’s soft enough. Very interesting options indeed. I hope my comments help you pick the best one that will fit your needs. Hakuhodo B533 is horse hair, therefore very efficient with strong applications (as you will see in the swatch) but a bit rough with delicate skin. It costs 18$. The Burberry No 10 is really soft and pointy, dense too, so you will think it’s fantastic, yes it is great but I just have little issues controlling the evenness of the whole application, don’t find it to be the best blender/smudger and that was reflected in the swatch too, it’s not dramatic but it’s a bit less easy to control. Will not be a problem but I have the impression that this brush is not and will never be a go-to for me. It’s made in France and it is known to be squirrel hair but that doesn’t have the look of squirrel hair to me, feels like squirrel, doesn’t look like it but it may be…. 32$. The Hakuhodo G5520 has been my go-to for I think 2 years, not sure… as soon as this one got released I bought it and was enjoying it for a very long time. During this past year my skin has changed and now I just need softer options. I did really truly enjoy it for precise application. It is blue squirrel/horse but I can more feel the horse than the squirrel … It is much softer than Mac brushes so if you don’t want or need to go with really soft ones, this is a great little brush at 21$, it will make you happy, it will blend and smudge anything and beyond. The Hakuhodo G5534 is less controllable, but the one I got is still quite precise even with its long soft flexible head. Not the most effortless option for lower lashline but it will fulfil the purpose too. 21$ and blue squirrel hair. The Chikuhodo Artist 10-1 is a bit too thick to replace the Suqqu S. Furthermore it is not sold by Chikuhodo anymore but only by other OEM companies and to be honest I don’t know which ones… I remember that when I ordered this one I was really convinced that I had found the Suqqu S dupe but I was wrong. It’s too rough for me today but since it won’t be at all on the models I think it will go in my kit, it has a long handle that allows me to keep some distance with the model and I love the balance of this brush, feels and sits perfectly in my hand. The Chikuhodo Z-10 has similar softness as the Suqqu S but the point is too tapered and I have no control on the application, just not dense enough at the tip. It will work but by the time you have put enough pressure to draw the line, the line will result much thicker than you thought would be and maybe not strong enough. The Wayne Goss is a blend of squirrel/goat hair, it is not yet available individually but it will. For now you can only buy it in a set. I can just urge you to get it, I heard angels the first time I used it… still hearing them every day I use it. It will make your application super quick and easy. I could just softly build up the application but it automatically delivers the intensity I want, an even line, just the perfect thickness. It’s not as soft at the Suqqu S but it makes the application easier and more wearable. 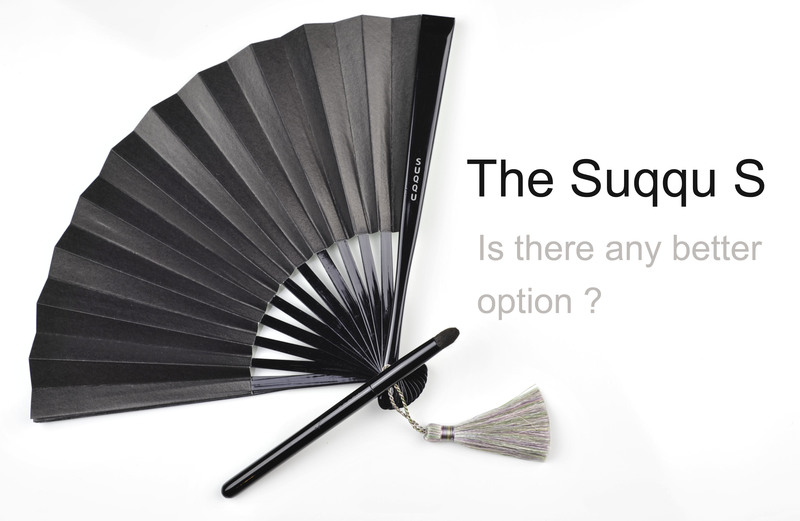 The Suqqu S always delivers a quite strong and thicker application so compared to the WG, the WG will be more forgiving. As I often say, we are not doing heart surgery, the differences between each brush are sometimes really small and indistinguishable… These are my own thoughts and experience with these brushes and I am aware they will not apply to every one. Wayne Goss 20 : it will be “affordable”, depends for who but it does deserve that price, (I think it will be around 20$). You will love what this little one can achieve and how easily it does it. Not yet available individually but it will be on Beautylish.com and Love-Makeup.co.uk, depending on your location. Soft enough for delicate eyes, a true gem. Chikuhodo R-S4 : I do consider it “affordable” too even through Now Eproject website, link here. I love how sultry the final application results, it can do the same job as a Suqqu S, outer V, lid, etc because you can also work with the sides of the brush in a perpendicular way. Just like the Wayne Goss but the WG is a bit firmer. I did not find “the” Suqqu S perfect dupe in terms of softness but I in terms of efficiency I am more than satisfied, I found my holy grail pencil brushes in the Wayne Goss 20 and the Chikuhodo R-S4. The Suqqu S was last modified: November 12th, 2014 by Sonia G.
Thank you so much for putting this post together! I’m bummed I missed out on the S, but the Chikuhodo & WG alternatives look fantastic. Definitely on my wishlist! Thank you so much for this post! 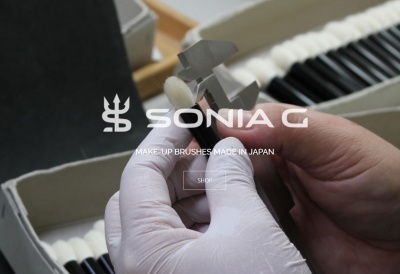 I am excited to try out a few of these brushes, after never being able to track down a Suqqu S.
Thank you Sonia! This is an amazing review/share! More brushes for my wishlist. Thank you sooo much for your support, big warm hug!!! I’m so glad that the Chikuhodo R-S4 is up there because I have my eye on that! The WG 20 is also looking fabulous too. Also that discontinued Chanel…. I tried.. because the background with white brushes is so difficult, found that this green is less bad than the others! You know, I was just checking the brushes I ordered in Japan and I realise that I bought the R-S4 all the way back then LOLOL! Along with two others from the new releases at the time! Btw, love the pictures with the fan, so creative and artistically done, made me happy to see them. As for the Chanel dupe, you may want to look at this website, https://www.jennypatinkin.com/shop/pin-point-liner-brush/. I saw a review of her brushes on beautyprofessor.net and they are said to be manufactured in Japan. She has a white goat brush that looks like the Chanel 24, not sure of the dimensions though. I’d never heard of these brushes before but they do remind me of Wayne Goss brushes. I did have a look at this company you linked, these are made by Hakuhodo and the little pencil looks like the G5514, unfortunatelly they don’t ship abroad (just usa and canada). Oh, that’s too bad, I was browsing on my iPhone, so I didn’t have a good view of it. If you ever need help acquiring anything from the US, just let me know. I’d be more than happy to help. Once again, you have done all the work for us! I love the photos with the fan as well, creative as well as functional in picture comparisons. I have a lot of the brushes you mention (your bad influence) but for me my HG is still the Chikuhodo Z10. I find even the WG 20 a bit too scratchy for me. I have the Chikuhodo R-S4 on its way to me now, just complete the mad collection, even though I have my HG. Thank you Bora, maybe I should have a look at your Z-10, sometimes they differ just enough to deliver more functionality and be a bit better. I’ll show you my WG if you show me your Z10 😛 hahahaha sowy…. It’s odd that my Artist 10-1 had a very soft pointed tip and looked more like your Z-10 (which I don’t have). It wasn’t easy to use the tip so I gave it away. Like you say, these brushes are small…and probably difficult to shape exactly alike. I have a beautiful tiny tapered Hakuhodo G522 and bought two more as backups. Neither are tapered or perform as well. I sent comparison photos to Hakuhodo hoping they could find me another tapered one and they were kind enough to send me photos of the best ones they had, but none resembled the first one. Conclusion was that I just got an exceptional brush the first time! On the other hand, I have 3 K005/Kokutan SL and all are beautifully tapered….but it is a larger eye brush. It would seem to me that a round pencil brush would be harder to shape? Maybe something you could ask while in Japan…which ones are difficult to shape or replicate? Many brushes are not always loved at once but some take time, our techniques changes and our products too, mine are changing/rotating on a weekly basis! at this moment I am rotating all the brushes in my collection and discovering some that I didn’t love and now they have actually a great potential! Oh you just read my mind!!! I was desperate to find a pencil brush, I dread the Sigma E30 one I have! I don’t mean to be a hater, but that’s one over hyped brand in my opinion, so hard and coarse brushes, they were total waste of money to me. I sometimes (very rarely, I have sensitive skin too) use the brush, but it’s like poking myself with a stick.. no more. I adore the Suqqu S shape, it’s so cute and round, I was thinking of running to a Hakuhodo shop and buying something similar, but I might consider the Chikuhodo instead. I see what you mean, we are not “haters” here, just honest and we all know there is honestly audience for every brush! We aren’t all similar but I truly hope you will enjoy that Chikuhodo, it’s not Suqqu soft but it truly is a HG for me today. I have the Chanel brush and I love it! Also the Hakuhodo G5520 and Kokutan Brush T. Like them too. Am lemming the Chikuhodo R-S4 now that I have read your post lol. Thank you, Sonia for completing such a comprehensive and amazing comparison of pencil brushes! You manage to describe your collection so well that it makes it easier for us to decide which ones to add to our collection. And thank you, Bora and Midnitedesire for adding your personal HG favorites. So interesting to find out what works for others! I prefer thinner less diffuse definition that I can widen as needed for under eye definition so use my Hakuhodo G5515 most often. 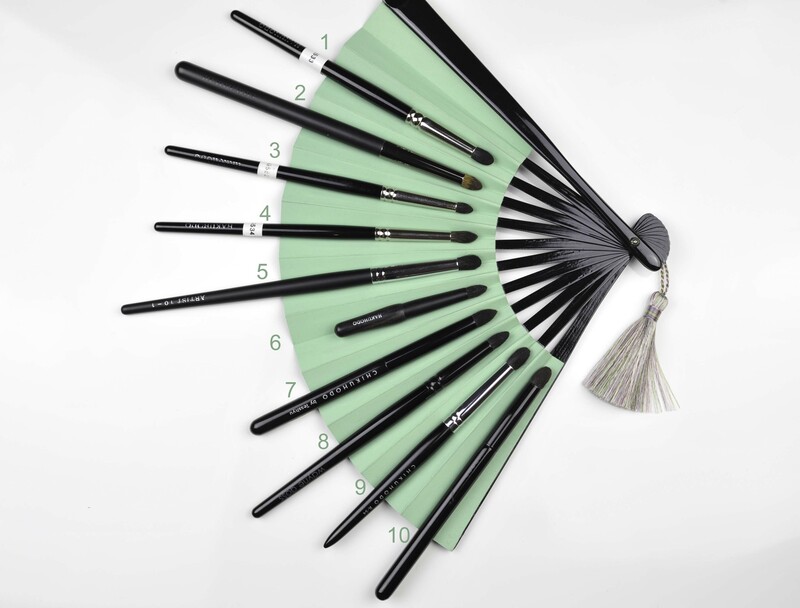 But since I missed out on the Suqqu S, have put the Chikuhodo R S4 on my list! thank you, I love if this can help!! wonderful! I’m lemming the Chikuhodo R-S4 now and if I read this earlier it would of been in my recent order lol I really like the Burberry brush because it is a good fit for my very small eyes, it became very flat and floppy after washing a few times…not sure how to fix that or just get a new one. flat and floppy ?? really ?? I fixed it with lab grade ethanol, the cleanser I was using probably caused it to become covered in a film. I had to use ethanol on my Koyudo C011 too because it got rid of the strong goat smell when it was new so they are all good now. I recently purchased the Koyudo C011 and Yojiya ebony shadow brush round and I find them to be quite big, more like a crease brush for me, I will give up this search for suqqu s dupe. Thanks for the info Selphia! Thank you Sonia for all the hard work you put into sharing your passion with us, seriously I don’t know how much money I would have wasted on rubbish brushes were it not for your guidance and evil genius! I say evil because I am not sure I am effectively spending less money hahaha! What I can tell you for sure is that it is not wasted but quite the opposite, what I have spent on the little masterpieces I now own thanks to you, I deem 100% worth the investment both in terms of performance and the joy they add to my morning routine. Hello! This post was extremely helpful! What online retailers ship Chikuhodo to the US besides the now-eproject? I don’t want to spend the minimum $100, are there any other alternatives? I love the artful use of the fan in the pictures! It so sad that kohlindo has closed. Now we cant buy chikuhodo within europe anymore. Do you have any experience with now e project Sonia? I want to order from the them, but im afraid of the custom taxes(Netherlands). my last order was actually with now eproject (but came directly from Chikuhodo), it was very well handled but having to place an order for such an high minimum amount is something they should try to change, not everybody want or can do that! I don’t know for mine because my bf picked the parcels up (he also had something for him and he told me he paid but it doesn’t know if it was for his parcel or for mine or for both…) and I couldn’t find it on the parcel ..
Well I really wanted the Chikuhodo maki e mk-2, but now it seems that the Suqqu Powder Brush is cheaper if u think about the taxes adding up. Guess il have to make it up with the koyudo res brushes to ease this pain(excuse to buy more). Just fyi, when I ordered from now e-project my package came directly from Chikuhodo and they marked the value waaay less than the actual price, not that it made a difference to me. We don’t pay taxes on imports valued less than ~$1000 in the US, but it may matter to those who do. Excelente post. A pesar de que recomiendas la de Wayne y la de chikuhodo, estaré pendiente cuando encuentres el clon de la chanel 24. También quiero la Koyudo C011 tiene muy buena pinta además de que me gustan mucho más las de pelo blanco por la versatilidad de texturas que se pueden ahumar. es que nos lo ponen super dificil, que pena que sea tan caro pedir ahi. Bueno si voy alla y la encuentro ya te diré! oh gosh RMK, “fine squirrel and raccoon hair” Raccoon hair is so rough that I will not buy them before I try them!!! The new Suqqu MUA tweeted that RMK has a new eyeshadow brush that is “AMAZING” and like the Suqqu S. Is it that one linked above? I think it looks slightly different from the picture…. Do you know and/or thing the CHIKUHODO Eyeshadow Brush Z10 is in anyway similar to Suqqu S? I just saw an imagem from z10 and thought they could be similar, since suqqu brushes are made by Chikuhodo. Do you think this brush from Hakuhodo is a closer alternative?? Hi Maria, thank you for the link! How does the Chikuhodo R-S4 compare to the Suqqu S in terms of softness? Hi Sonia – how does the fine kalla KK-004 compares with the kokutan t in terms of product pickup, deposit, and blending? Which brush is more dense? Hi Sonia! I think I finally found a brush that is everything I’d hoped for in the Suqqu S. The Chikuhodo Takumi CHT8, while not squirrel, applies and blends eyeshadow with a soft directionality and I like that it’s goat because it works with a variety of textures. It’s my most used brush and my second favourite eyeshadow brush, the firm favourite being the flat Kiwami eyeshadow brush that I baby and use only on special occasions, though Surratt seems to have produced something similar. Hi, has anyone ordered the RMK E – is it soft? It looks similar to the Suqqu S? Thanks! The new Wayne Goss 20 is quite different now. What about WG 05? Hi Damla, it’s the same idea, both functionning as a pencil however the WG 05 is much more precise and firm. I use the WG with darker colors when I want more precision and the Suqqu with medium shades where I don’t mind getting further away from the lashline while smudging. If precision is what you are looking for, the WG05 will fit your needs but it’s not as soft as the Suqqu, there is still quite a difference because the WG is much more shorter and smaller.